He was taken for scans soon after the incident and was fine later. The cricketing fraternity would have feared the worst when Ashoke Dinda received a hard and nasty blow to his head in the cricket field on Monday. Dinda was hit on the forehead while attempting a sharp caught-and-bowled during Bengal’s Twenty 20 practice match at Eden Gardens. The mishap had taken place when batsman Birender Vivek Singh hit a straight drive and Dinda attempted the catch on his follow through. However, the right-arm pacer could not stop the ball and it went on to hit him on the forehead. Dinda soon fell on the ground as the players rushed to his aid. Medical staff at the Eden Gardens also attended to him at the ground. But luckily, the 34-year-old stood up and even bowled a couple of deliveries before walking off the field, allaying fears of a serious injury. He was later sent to the hospital as a precautionary measure. The latest incident has once again highlighted the dangers the bowlers on a day-to-day basis in the field. 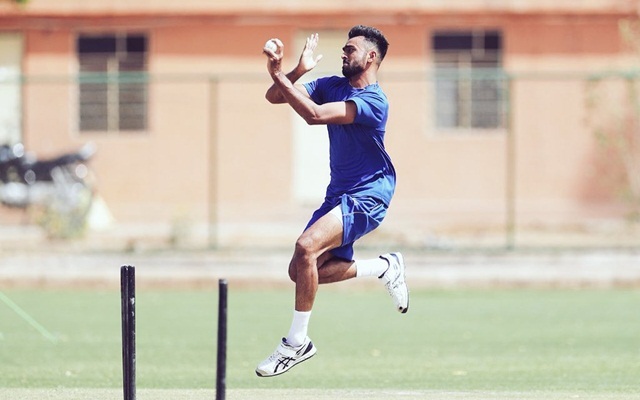 Time and again, there have been calls to introduce safety measures for the bowlers and on Tuesday Saurashtra captain Jaydev Unadkat reiterated it too. The left-arm pacer took to Twitter to suggest that it is high time the face-masks are introduced for the safety of the bowlers. He also hoped that Ashoke Dinda is fine before asking senior spinner R Ashwin his views on the matter. “About time that a “face-mask” for bowlers makes its way into all that has evolved in cricket. It’s scary how this kind of incidents have become frequent in our game! Hope you good Dinda @dindaashoke .. What do you say Ash bhai? @ashwinravi99,” Unadkat tweeted. Fortunately, the medical check-ups did not reveal any danger whatsoever for Dinda. An official from Cricket Association of Bengal (CAB) assured that there was nothing to worry about before revealing that the ace pacer has been asked to take rest for a couple of days. “Dinda looked fine as he completed the over before returning back to the dressing room. As a precautionary measure, he was taken for scans. There is nothing alarming but he has been advised two days of rest,” the CAB official said. Bengal, meanwhile, will be hoping that Dinda gets back to his best as they gear up for the Syed Mushtaq Ali Trophy. Bengal will open their campaign against Mizoram in their group D fixture at the Barabati Stadium in Cuttack on February 21.